It’s rare to find a children’s picture book that makes you laugh out loud. A giggle – yes. A smirk – most certainly. But when mum or dad lets out an almighty guffaw – this is a funny book indeed. Oh – and the kids get a giggle, too. 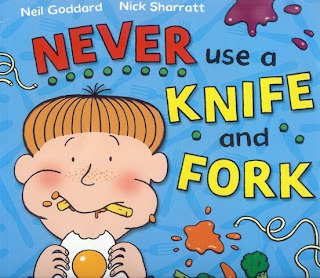 Neil Goddard’s simple, adorable, rhyming picture book is a study in hilarity. Not only because the actions of these food-munching kids is very true to life, it’s something we’ve all done and something we constantly harangue our own children NOT to do. Oh how I love naughtiness books, oh yes I do. And so do kids. Nick Sharratt’s delightful, bright illustrations add even more movement and fun to the text. My fave page? The undies that make a great depositary for chips. You’ll just have to buy the book to see it.